Black Ink Prints is a hand-made small batch, design + print craft. I hand-make stencils using an old fashioned method carving images with a razor blade and filling the blank space with ink. My designs and method were inspired by the bold creations of graffiti and stencil artists, using block colors and negative space to create an eye catching image that is balanced and integrative of its surrounds. My stencils originated with a love of the playfulness of street art, and evolved into creating my own images of hip-hop artists, musical icons, and Chicago sports heros. My most recent Circle of Life Collection features flowers, antlers, and skulls (oh my!). The combination of bones and antlers paired with a delicate flower gives a balance to 'strong' and 'fragile', heavy and light. It celebrates bringing the outside in, by adding a touch of rugged and soft to your home! 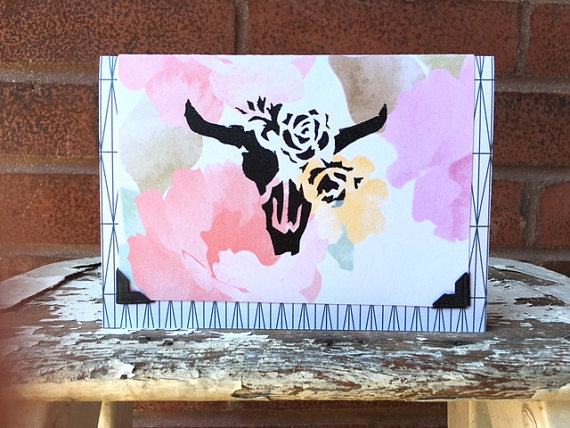 These stencils are printed onto all occasion cards, shirts, or pillows which I adorn with a little gold or rusty red stitching for a pop of color. Whether I am printing on a card, a t-shirt, a pillow, or the occasional community wall that needs beautifying, I always enjoy finding the light and dark shapes that piece together to create a whole image.